Hey, welcome to my very first post. I decided to make my first post a haul. I recently bought a bunch of Korean products. 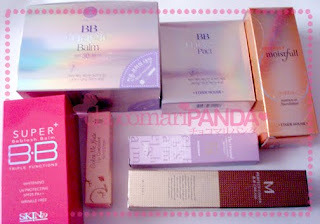 Which includes some stuff from Etude House, Skin79, & Missha. I really wanted to restock on BB Cream and ended up getting a couple of other things. I'm not sure if I'm selling those or not, I always get extra just incase someone wants one (my mom, relatives or friends) plus it saves on shipping. So if i end up keeping them I'll do reviews for those also. For those who don't already know BB stands for Blemish Balm. It was supposedly first used as an after-surgery cream. It covers and helps the skin heal at the same time, then it was later manufactured as a beauty product. Its like an all purpose foundation/base, some people use it as a base or use it alone.it offers coverage and also certain benefits to the skin like sun protection, whitening, evening complexion and etc. There are many types of BB creams out there with different benefits, ingredients and functions. I personally love the SPF it is very convenient! Well I'll be doing the reviews for these very soon, so check that out. Welcome to the blog world hehehe...! you know I've just ordered some Missha bb cream to try ... just waiting for them to arrive in the post sometime very soon. Can't wait for your reviews on the bb products... there's so many out there that it gets confusing when deciding on what to buy!